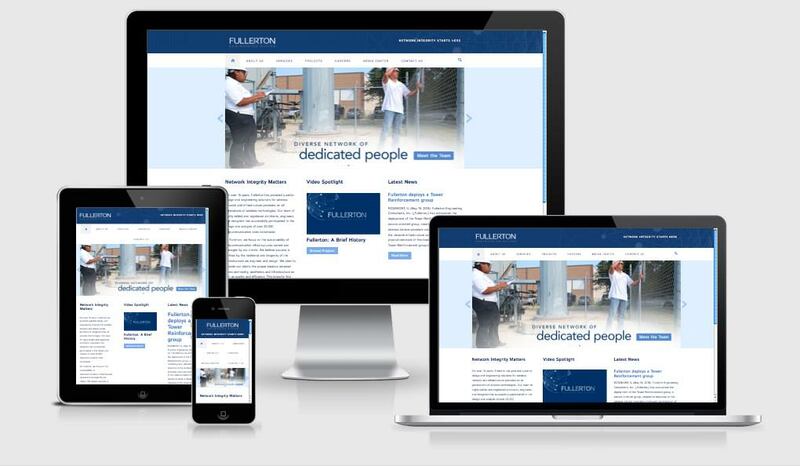 Fullerton’s new mobile responsive website shown on 4 different devices. If you use a mobile device (who doesn’t these days? ), then it’s highly likely that the bits and bytes of your voice and texts has passed through the radios and towers that Fullerton built. They are all about quality people, quality engineering, and dedicated customer service, which evidently is an effective strategy, because they are growing, and fast. Not long ago they were a small fish in a big ocean, now they build wireless networks for lots of big fish network provider customers — many of whom you would know by brand name, and you probably even pay them every month for your cell bill. Website: Fullerton Engineering Consultants, Inc.
More project details coming when I have more time… until then, stop texting, give the airwaves a rest, put down your phone and go outside and have some fun. Do you need a mobile-responsive website (or a mobile friendly conversion)? Do you need advanced features like staff profiles, project/case studies, directories? Rob Rusnak created my business' website with impressive professionalism. It was my vision realized ... I plan to continue this professional relationship and I enthusiastically recommend his web design and development services.